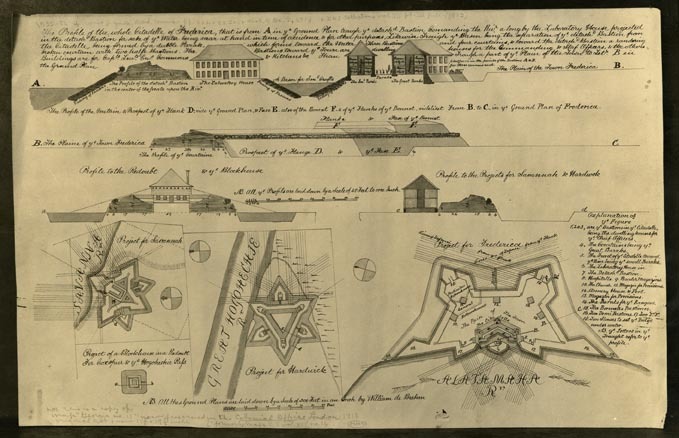 Photograph of Fort Frederica plan, ca 1755. From the Foltz Photography Studio collection, MS 1360. Although the Georgia Trustees originally envisioned the new Georgia colony as a second chance for debtors in British jails, the geographic location was also ideal to defend the British colonies from Spain, which occupied Florida to the south. When Oglethorpe left the colonists in Port Royal to scout for the location of the new colony, he selected a spot that was very close to friendly South Carolina and as far as possible from unfriendly Spanish-occupied Florida. Some of the first colonists who arrived on the Anne played key roles in defending the colony. Noble Jones was a surveyor who paid his own way on the Anne, and once in Georgia he served as a doctor, constable, and carpenter. He was rewarded with 500 acres on the Isle of Hope a few miles south of Savannah that would also serve as an outpost to protect the young city. Jones called his plantation Wormsloe, and he built a fortified tabby home to serve as a guard post and line of defense against invasion. In 1736 Oglethorpe established Fort Frederica on St. Simons Island to act as a defense to the south against the Spanish. Fort Frederica was located in an ideal spot, a high bluff overlooking the marsh and inland waterways. This spot would become an important part of Georgia’s history a few years after Frederica was founded and settled. 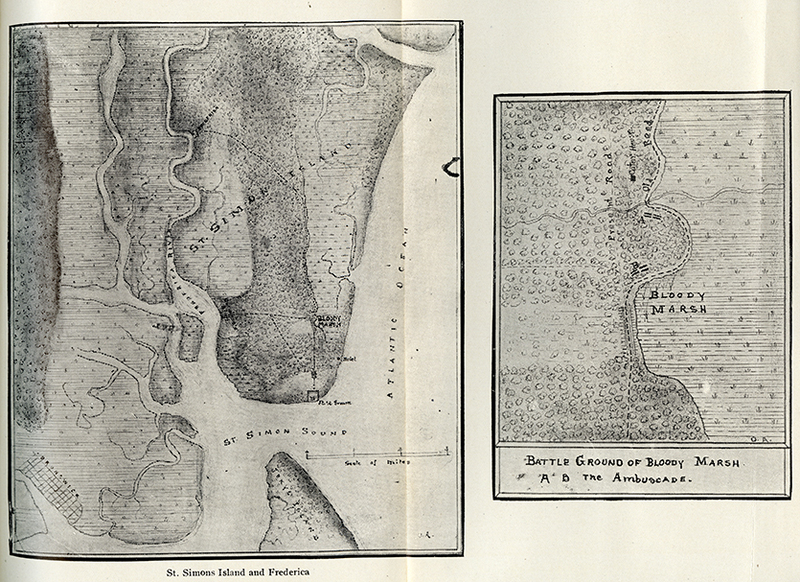 Map of St. Simon and Frederica showing Bloody Marsh Battle from The Spanish official account of the attack on the colony of Georgia. Georgia Historical Society Main Collection. The War of Jenkins’ Ear first began before the Georgia colonists even left England. In 1731 a Spanish privateer cut off the ear of British captain Robert Jenkins in retaliation for Jenkins raiding Spanish ships. Captain Jenkins presented his ear to Parliament, and the British people demanded retribution. During the 1730s, while Oglethorpe and the colonists were settling Savannah, Spain and England negotiated to settle their disputes but they never reached a conclusion. In 1740, Oglethorpe gathered his forces to besiege St. Augustine in Spanish Florida. He traveled in ships from the Royal Navy taking his regiment of soldiers along with Carolina Rangers and Indian warriors. Unfortunately, the siege failed, and Oglethorpe retreated north to Fort Frederica on St. Simons. In July 1742, ships with thousands of Spanish troops landed on St. Simons Island, but the British forces turned back an advance force at Fort Frederica using the location of the fort to their advantage. They then proceeded to defeat the Spanish at the Battle of Bloody Marsh, which caused the Spanish to retreat for good. The Spanish never attacked the British colonies on the east coast again thanks to the efforts of Oglethorpe and his troops. To reward Oglethorpe King George II promoted him to general, and in 1748, Britain and Spain agreed on the St. Mary’s River as the border between Georgia and Florida. The Spanish government sent Don Manuel de Montiano to Florida as acting governor in 1737 in a direct response to British aggressions against the colony. During the 1740 siege on St. Augustine, led by Gen. James Oglethorpe, Montiano defended East Florida and had Fort Matanzas built. Manuel de Montianao Letters, MS 0572 includes a volume containing the letters of Don Manuel de Montiano to Juan de Guemes y Horcasitas, Governor General of Cuba, 1737-1741. They present the Spanish side of the Siege of St. Augustine in 1740. In Spanish, these letters were copied from the originals and certified as true copies by Antonio Alvarez, keeper of the Public Archives in St. Augustine, Florida, before 1843. The letters were translated to English and published in Collections of the Georgia Historical Society, Volume VII, pt. 1. “All the 12 English deserters say in confirmation of one another that General Oglethorpe has gone for reinforcements, with the intention of returning upon this place next spring. Although I do not believe that the settlers of Carolina will give more help on account of the vexation and annoyances of this campaign, yet his authority and restless spirit may move them, as well as the numbers he is said to expect from Europe, according to some, two thousand, to others, two regiments. Relative to this, Your Excellency may consider the best measures to put this place in a new state of defense…” Excerpt from letter dated July 28, 1740. 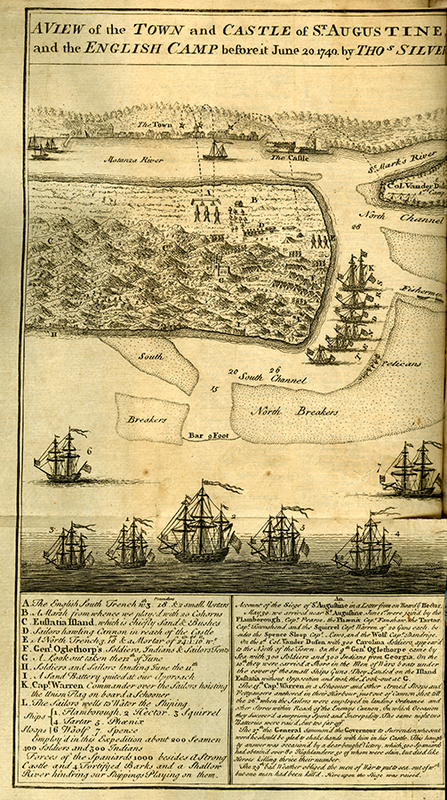 General Oglethorpe’s Account of the Spanish Invasion of Georgia, July 30, 1742. In Collections of the Georgia Historical Society, Volume III. This excerpt from the letter describes the Battle of Bloody Marsh from Oglethorpe’s perspective. “A view of the Town and Castle of St. Augustine and the English Camp before June 20, 1740 by Tho Silver.” Gentleman’s Magazine. Georgia Historical Society Serials Collection.